Why are we so afraid to let our kids play outside, when we know that such activity is vital for their physical and mental health? Our fears are so extreme that in a few cases, parents have been arrested for allowing their children to play outside unattended. My mother would have been sent to jail on an almost daily basis. 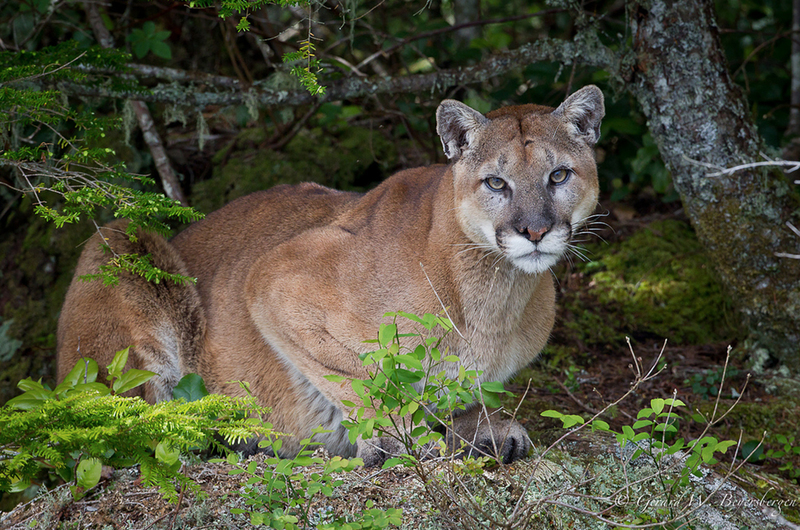 Animal Attacks: As their natural territories shrink, top predators are living closer to our urban centers (not far from my home, cougars have been found in Seattle city parks). But in all of North America, we can expect fewer than three people to die each year due to bears, cougars, coyotes, and wolves — combined. Some researchers believe that our fear of these animals is innate, dating back to prehistoric times, when humans fell prey to bear-sized hyenas and saber-tooth cats. Today, however, the chances are miniscule of meeting our demise at the paws or teeth of a large carnivore. Abduction: The U.S. experiences about 115 “stereotypical kidnappings” annually — involving someone the child doesn’t know, and in which the child is held at least overnight, transported a distance, and killed or ransomed. This is truly scary stuff. At the same time, such kidnappings are incredibly rare… only a little more common than getting struck by lightning. fewer than 500 other accidents from bee stings, horseback riding, overheating,hunting, lightning, playground falls, skiing/snowboarding, snake bites, and trees falling on people. Adding up all these statistics, we can predict slightly over 10,000 outdoor deaths this year. This is a small portion of the 2.5 million people who die annually in the U.S. — over half of them from heart disease, cancer, and diabetes alone. If your chances of dying outside measured four blocks long, your chances of dying from these three illnesses would be longer than running a marathon! And active outdoor time has been repeatedly documented to reduce our chances of getting all three of these deadly diseases. We are exchanging a small amount of risk for more certain health threats caused by a sedentary lifestyle. Our neighborhoods have additional threats to children’s safety, including gang violence, poor air quality, and lack of access to green spaces. These are complex issues that can’t be solved by simply encouraging parents to send their kids outside. We have tough work to do such as monitoring parks, passing legislation to clean the air, and demanding quality urban planning. However, if we don’t begin to address some of our most basic fears of getting kids outside (the 3 A’s), we are unlikely to successfully tackle these more difficult obstacles. Much of our fears stem from 24/7 access to sensationalist headlines. We are barraged by stories of polar bear attacks, kidnappings, and playground deaths. When you combine the abundance of scary news flashes with the psychological phenomena known as the “recency effect” (we remember best what we saw most recently), it is no wonder that we are afraid to let our kids run around outside. As a father, I want to protect my kids but my answer can’t be keeping them indoors away from harm. Instead, I am focusing my energy on helping them be safer outside. I want my children to be crystal clear on what to do when encountering strangers, wildlife, and dangerous plants. I’m teaching them how to avoid street traffic, and how to properly wear helmets and life vests. By encouraging them to play safely outside, I’m protecting them from a host of much bigger risks — and they’re having a lot more fun too. Through the North American-wide Get to Know Contest, we help encourage Canadian and American youth to get outdoors, connect with nature and celebrate this connection! The Get to Know Contest invites youth (19 years and younger) to share their outdoor experiences and help to celebrate nature and our wild neighbours through the creation of nature-inspired works of art. Youth’s submitted artwork is showcased in the popular Get to Know Online Gallery helping to celebrate every child that participates and sharing their work with peers both in their communities and around the world!e. A not for profit based in Canada and the U.S., our mandate is to promote education in order to raise a generation of Canadians and Americans who are inherently aware of their impact on the environment and how their positive interaction with local wildlife can help preserve our natural wonders for generations to come. The Get to Know Contest accepts entries in 5 unique categories: Art, Writing, Photography, Video and Music! Youth can enter as many categories and with as many entries as they wish, giving youth more opportunities than ever to participate. Youth entries don’t necessarily have to feature wildlife or fauna; they just need to be inspired by nature or the outdoors! This therefore could be anything from a painting of a waterfall, a photograph of youth hiking, a video or piece of statement art about the issue of plastics in the ocean, or even a song about pollination! The contest’s message is purposely broad as to not limit youth’s creativity and unique voices. After all, everyone has a different and personal relationship with nature and we hope youth share theirs through the Get to Know Contest and this continent-wide movement! The Get to Know Contest is on now and runs right until November 1, 2013. Please help spread the word and encourage youth to participate. There are some fantastic prizes to win including art supplies, books, musical instruments including an acoustic guitar, outdoor gear, a canoe trip or an amazing Vancouver weekend getaway! For more information and to enter, be sure to visit www.gettoknow.ca. Questions or concerns, please feel free to email info@gettoknow.ca. In a welcome break from partisan gridlock, congressional leaders from both sides of the aisle have come together to advance environmental education and outdoor learning opportunities for students across America. Earlier this week, Congressmen John Sarbanes (D-MD) and Michael Fitzpatrick (R-PA) and Senators Jack Reed (D-RI) and Mark Kirk (R-IL) reintroduced the No Child Left Inside Act of 2013. If passed, the bill would encourage states to implement environmental literacy plans for K-12 students. As a former environmental educator myself, I know first-hand the value of learning in and about the environment. I have seen the look of surprise on kids’ faces when they come to understand that water does not starts its journey at the kitchen sink, or when they do something as simple as pull a carrot out of the ground for the first time. I have witnessed classroom teachers marvel at the transformation of some of their most challenging students, who after an outdoor class on forest ecology, suddenly show an aptitude for learning. Schools and educators are increasingly seeing the value of environmental education which has been shown to improve motivation to learn, self-esteem, critical thinking and academic performance across subject areas. Research has even found that just a few days of outdoor environmental instruction may improve science test scores by as much as 27 percent. Getting outdoors also encourages physical fitness, reduces stress and lessens the symptoms of attention-deficit disorders which, in turn, improve the ability of our students to learn. Safeguarding our communities and protecting our air, water and lands from environmental threats will require a sustained effort and a well-educated generation (or two) to respond to challenges with innovative and smart solutions. Today’s youth will have to help tackle future environmental threats as adults, yet our students are not being provided with the basic environmental education foundation needed to address these challenges. Unfortunately, schools are pressed for resources to implement environmental education programming. The No Child Left Inside Act would begin to address this challenge by encouraging states to develop and implement environmental education plans for their K-12 students. Sierra Club is committed to ensuring that kids and youth have opportunities to explore and enjoy the natural world. Through a vast network of volunteers, Sierra Club’s Inner City Outings program is working hard to give tens of thousands of young people, who wouldn’t otherwise have the opportunity, meaningful outdoor experiences each year. Sierra Club is proud to support the No Child Left Inside Act to ensure that students across America have similar opportunities to learn in and about the environment. The No Child Left Inside Act is also supported by the No Child Left Inside coalition and the Outdoors Alliance for Kids. 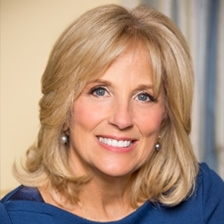 Guest blog by Jackie Ostfeld. Originally appeared on Sierra Club’s Outdoors blog. The story of Great Outdoors America Week 2013 is best told through photographs. Sierra Club Outdoors hosted 15 volunteers for a week filled with lobby visits, briefings, receptions and events. We participated in 20 meetings with elected officials where we advocated for increasing opportunities for kids and youth to get outdoors. We hosted a congressional briefing panel on the military community and the outdoors. We were joined by Interior Secretary Sally Jewell for the “Kids, Youth and the Great Outdoors Festival and Walk on the National Mall” put together by the Outdoors Alliance for Kids. We recovered from a long week with a Sierra Club Outing to Great Falls National Park. And those are just the highlights. Here’s our first round of photos from GO Week. Sierra Club Outdoors hosted a congressional briefing panel, “Military Community and the Outdoors,” with Major General James A. Kessler, Marine Corps Installation Command; Stacy Bare, Army Veteran and Sierra Club Outdoors Director; Marine Corps Colonel Broughton; Sheri Robey-Lapan, Blue Star Families; Mike Christian, Marine Corps Veteran and Director of Outdoor Research Government Program; and Joshua Brandon, Army Veteran and Military Organizer for Sierra Club Outdoors. During GO Week, the Outdoors Alliance for Kids (of which Sierra Club is a co-founder) hosted the “Kids, Youth and the Great Outdoors Festival and Walk on the National Mall” to draw attention to the importance of increasing access and opportunities for kids and youth to get outdoors. This event would not have been possible without the ongoing commitment of 50+ members of OAK. Special thanks to Michael Carroll and Paul Sanford and of The Wilderness Society, Susan Yoder of the American Camp Association and Sarah Danno and Katie Joyce rockstar Sierra Club Outdoors summer interns for all of the hours you put in to making this event (and GO Week) a success. Additional thank yous to REI, GirlTrek, American Canoe Association, Sierra Club, The Wilderness Society, National Wildlife Federation, National Recreation and Park Association, Outdoor Nation, American Hiking Society, YMCA of the USA, Earth Conservation Corps, AmericaWalks, International Mountain Bicycling Association, American Camp Association, Clif Bar, Outward Bound, and the National Oceanic and Atmospheric Administration. Sierra Club’s Baltimore and Harrisburg Inner City Outings groups hosted a kayak demo station at the “Kids, Youth and the Great Outdoors Festival” on the National Mall. Thanks Molly Gallant, Nicole Veltre, Pat and Tony Reilly for lending your expertise (and your boats). Festival go-ers explain why they get outdoors. Best Interns Daniel and Izzy (top left) were on site shooting video – stay tuned. Interior Secretary Sally Jewell arrives at the Kids, Youth and the Great Outdoors Festival and heads straight for the kids. Here she is meeting a group of youth from the YMCA. Secretary Jewell joins our friends at Outdoor Nation. ON Youth Ambassadors represent! Secretary Jewell joins the Outdoors Alliance for Kids for a press conference on the importance of connecting kids, youth and families with the natural world. Thanks Sierra Club Angel Martinez for holding up our sign! From left to right, Chair Nancy Sutley, White House Council on Environmental Quality; Jo-Ellen Darcy, Assistant Secretary of the Army for Civil Works; Michael Brune, Sierra Club Executive Director; Secretary Sally Jewell, US Department of the Interior; Arturo Cervantes, Outdoor Nation Youth Ambassador; Jackie Ostfeld, Chair, Outdoors Alliance for Kids and Policy Manager, Sierra Club Outdoors; and Jamie Williams, President, The Wilderness Society. Thanks to all of our press conference speakers for their ongoing commitment to connecting kids and youth with our natural heritage. We have arrived at the Capitol. Sierra Club joins Interior Secretary Jewell and the Outdoors Alliance for Kids for a walk on the National Mall following the “Kids, Youth and the Great Outdoors Festival.” Big thanks to Vanessa Garisson and Morgan Dixon of GirlTrek for leading the walk. It was a hot day and the enthusiam of our GirlTrek friends kept us going. During the GO Week Congressional Awards Celebration, Senator Bill Nelson of Florida receives an award for his work to protect America’s great outdoors and to connect veterans with our public lands. Sierra Club Outdoors uber-volunteer Mark Walters (in the middle) is there to present the award. Sierra Club Outdoors GO Week Delegates unwind with an outing to Great Falls National Park after a long week advocating for connecting America with the outdoors. Thanks to Sierra Club Potomac Regional Outings Leader Mike Darzi for leading the hike. From left to right, meet our delegation (or most of it): Eric Uram, Denis Rydjeski, Jackie Ostfeld, Lydia Leos, Maggie Davenport, Monica Augustine, Sarah Danno, Kelly Mieszkalski, Tony Reilly, Katie Joyce, Pat Reilly, Mike Darzi, Mark Walters and Betsy Edlredge. 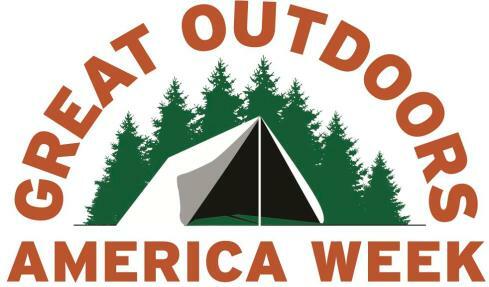 Great Outdoors America Week (GO Week) starts today. The Outdoors Alliance for Kids is proud to participate in GO Week 2013 where we will join our partners to ensure kids, youth and families across the nation have opportunities to get outdoors. GO Week is the preeminent event celebrating our collective connection to the great outdoors while advocating for its future. As one of the largest annual conservation and outdoor focused events in Washington DC, GO Week raises awareness around outdoors issues, and brings together hundreds of diverse organizations and activists to meet with lawmakers and administrators to advocate for our outdoor way-of-life. During GO Week, OAK will advocate for policies that enhance opportunities for children, youth and families to enjoy the outdoors. 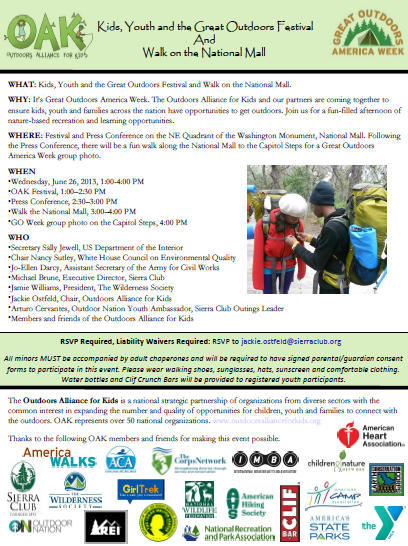 We’ll also be hosting a “Kids, Youth and the Great Outdoors Festival and Walk on the National Mall” with Secretary of the Interior Sally Jewell, White House Chair of the Council on Environmental Quality Nancy Sutley, Assistant Secretary of the Army for Civil Works Jo-Ellen Darcy, Sierra Club Executive Director Michael Brune, The Wilderness Society President Jaime Williams, Outdoors Alliance for Kids Chair Jackie Ostfeld, Sierra Club Outings Leader and Outdoor Nation Youth Ambassador Arturo Cervantes, and dozens of OAK members and partners. Follow OAK on Twitter for updates all week long.